Anthony Azzopardi is set for a big payday if his exciting pup Seal The Deal can salute in the final of the Launching Pad, and it’s not just in the form of the $150,000 winners cheque. Entering the Launching Pad series with four wins from six starts Seal The Deal was the big mover in the all-in market, his price being slashed from $26 to $12 soon after the market was released. “Yeah we backed him,” Azzopardi said. 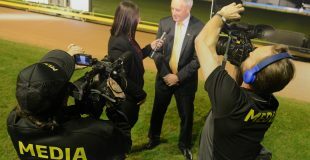 Seal The Deal justified the kennel’s confidence with a brilliant victory on his Sandown Park debut when overcoming box 6 to win his Launching Pad heat by a length in 29.55. While the financial rewards through the $432,000 series are obvious, the real rewards run deeper than a booming account balance. Owned and bred by Azzopardi’s partner Kylee Osborne, Seal The Deal is one of the first pups sired by Azzopardi’s dual group 1 winner Zambora Brockie to hit the track. Osborne also raced his dam (Anastasia), so there is a strong family connection with the pup, and the pride with which Azzopardi speaks about the achievements of Seal The Deal is obvious. While Seal The Deal was impressive, kennelmate Dolly Mac was equally so. Dolly Mac burst onto the racing scene in October last year, winning her first five starts before suffering an injury in December. After several setbacks, Azzopardi decided to aim for the sweepstakes event and was rewarded with a 29.68 win in her heat. “It’s been bit of a task, we’ve had to be patient and put in a lot of hard work. With her preparation, we couldn’t afford for anything to go wrong so we had to be on top of everything. For her to win tonight, for the owner, for us, and for her is a big thrill,” he continued. Azzopardi expects her to improve with continued racing, and ominously, believes she has the ability to be one of the country’s premier chasers. “It was her first 500 (since her injury), so she’ll find a few lengths. Embossed rounds out Azzopardi’s three pronged attack on the Launching Pad semi finals after scrapping through to the semis after running fourth in his heat. The Launching Pad is Australia’s only sweepstakes event, with 64 positions in the heats available for $2000 per spot. It is open to greyhound with 1-6 wins and no more than 30 starts attracting some of the country’s most exciting prospects. The semi-finals will be run on Thursday night with the final will be run on Thursday 18 April. Click here for your free form guide for Thursday night’s meeting.